University of Chicago Press, 9780226475332, 366pp. 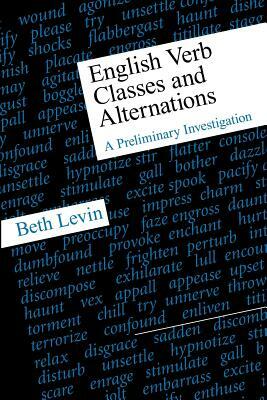 In this rich reference work, Beth Levin classifies over 3,000 English verbs according to shared meaning and behavior. Levin starts with the hypothesis that a verb's meaning influences its syntactic behavior and develops it into a powerful tool for studying the English verb lexicon. She shows how identifying verbs with similar syntactic behavior provides an effective means of distinguishing semantically coherent verb classes, and isolates these classes by examining verb behavior with respect to a wide range of syntactic alternations that reflect verb meaning. The first part of the book sets out alternate ways in which verbs can express their arguments. The second presents classes of verbs that share a kernel of meaning and explores in detail the behavior of each class, drawing on the alternations in the first part. Levin's discussion of each class and alternation includes lists of relevant verbs, illustrative examples, comments on noteworthy properties, and bibliographic references. The result is an original, systematic picture of the organization of the verb inventory. Easy to use, English Verb Classes and Alternations sets the stage for further explorations of the interface between lexical semantics and syntax. It will prove indispensable for theoretical and computational linguists, psycholinguists, cognitive scientists, lexicographers, and teachers of English as a second language.